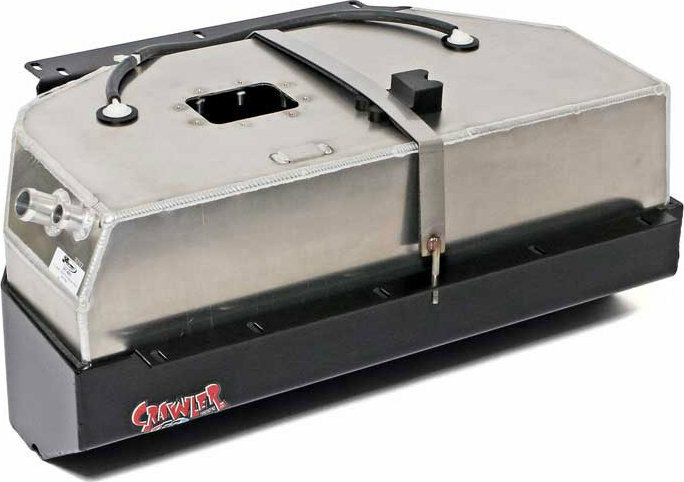 The GenRight Crawler Extended Range Gas Tank is prefect for those guys who are stuck with the stock 15 gallon tank. This tank holds an extra 5 gallons of fuel and still fits in the stock location in a Jeep Wrangler YJ for those long distance trips. Sorry, no axle move back is possible with this model tank and ground clearance is about the same as the stock YJ tank skid. This production built gas tank is heavy duty tank is trail proven. The assembly mounts in the factory location and is it designed to work with all your factory emissions equipment so you won't get and check engine lights or have computer issues. Same as stock 20 gallon fuel capacity. Still works with leaf springs. Mounts in stock tank location with 7 factory bolts. Proprietary sump to trap gas at the fuel pick up. CNC Machined fittings are TIG welded. Multiple internal baffles to reduce fuel movement. This tank is designed to accept the factory fuel pump or sender module from a '87-'95 Jeep Wrangler YJ equipped from the factory with a 20 gallon Plastic Tank (NOT the 15 metal tank found in a few model years). This tank will ONLY fit with a Dana 35 or Dana 44 or similar sized rear axles in the stock location! Installation of this product MAY require changes to the last 14" of the exhaust tail pipe. This tank does NOT require a body lift. Fits well with Currie brand Anti-Rock type rear sway bars. If you will be using the factory YJ fuel module/pick up you will need to lengthen the unit 1" to reach the bottom of the tank.